In 2016 World Routes will return to China. Hosted by Chengdu Shuangliu International Airport, we would like to invite you join the face-to-face meetings that shape the worlds future air services, and present your organisation with the perfect platform to meet with your top targets. Accompanied by an Exhibition “Networking Village”, World Routes Strategy Summit, Route Exchange Briefings and industry renowned social functions, the event offers a complete package, where decision makers from across the globe discuss the industry’s future and debate the hottest issues facing the market. The attendee list for World Routes is now available on Routesonline.com and with only 5 months to go until the event opens in Chicago, registrations are flooding in from all corners of the globe. World Routes, which is the essential global gathering for aviation organisations from across all continents and countries, brings together the largest range of airlines, airports, tourism authorities and civil aviation authorities. Network Planners and other key decision makers from a wide range of carriers will attend this year’s event which will take place in Chicago, 20-23 September 2014. The 20th World Route Development Forum will be the largest Routes event to date with an expected 3,000 high profile delegates in attendance. Airlines that have registered this week include: Bangkok Airways, Virgin Atlantic Airways, Airline4, TACV, Saudi Cargo and Omni Air International. The most recent airports to register for World Routes include: Radom Airport, Melbourne Airport, Glasgow Airport, Prestwick Airport, Cambridge International Airport, Orlando Sanford International Airport, Rio de Janeiro International Airport and San Diego International Airport (SDCRAA). Click here for the most up to date attendee list. Many notable national carriers have already confirmed their attendance by registering early including: Air France, Air India, American Airlines, British Airways, Hainan Airlines, Iberia, Japan Airlines, South African Airways and Turkish Airlines, whilst the 3 major carriers from the Middle East (Emirates, Etihad and Qatar Airways) have also registered early. 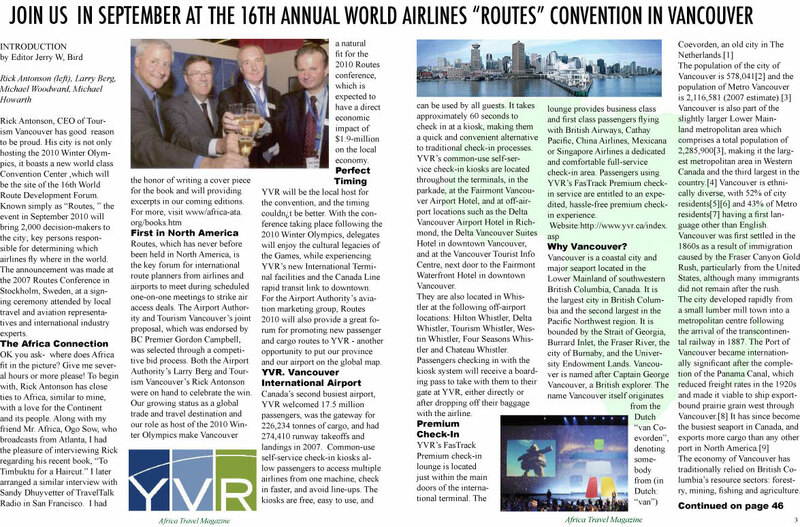 2014 will see World Routes return to the US for the second year in a row after last year’s event, which was the first time any Routes event had taken place in the country. The 20th anniversary event, which will be co-hosted by the City of Chicago Department of Aviation (CDA) and Choose Chicago, the city’s tourism organisation, will be held at McCormick Place, the largest convention facility in the Western Hemisphere. With the most diverse economy in the United States, and home to several of the aviation industry’s leading companies, Chicago makes the perfect home for the 20th World Route Development Forum. This week has seen confirmation from two further Airline CEOs that they will take part in the Routes Africa Strategy Summit which will open this year’s Routes Africa event at Victoria Falls in Zimbabwe. Monwabisi Kalawe, CEO of South African Airways and Cornwell Muleya, CEO of Air Uganda have both agreed to participate in the Strategy Summit along with Tewolde Gebremariam, CEO of Ethiopian Airlines who will give the keynote address. Routes Africa is the only network planning forum for the African region and the 9thRoutes Africa will take place in Victoria Falls, Zimbabwe on22-24 June 2014 hosted by the Civil Aviation Authority of Zimbabwe. Around 300 key decision makers from across Africa and beyond are expected to gather at the annual event in 2014 to discuss air service development. The event attracts a wide range of carriers interested in developing air routes in Africa with almost 30 carriers already registered. Along with Ethiopian Airlines, South African Airways and Air Uganda, carriers from the region who have so far confirmed their attendance at the event include Air Zimbabwe, Fastjet, Air Seychelles, Comair, Rwandair, Air Burkina and Arik Air. In addition many out of region carriers have signed up to attend with registrations received, so far, from American Airlines, Etihad Airways, Qatar Airways Cargo, Vueling, Iberia, Emirates and Turkish Airlines amongst others. Click here for a complete and up to date list of airline attendees. ROUTES AFRICA AWARDS WINNERS ANNOUNCED! Currently Routes Africa is ongoing in Kampala, Uganda. Last night during an impressive networking evening which took place on the stunning Lakeside Pool Lawns of the Speke Resort, which sits right on Lake Victoria, Uganda, Kilimanjaro International Airport was announced as winner of the African heat of this year’s Routes Airport Marketing Awards. Over 300 aviation professionals were gathered to witness the presentation of the awards and to take part in the 8th Routes Africa – the largest route development event for the entire African region, which this year is hosted by the Civil Aviation Authority of Uganda and Entebbe International Airport. The Routes Airport Marketing Awards have become synonymous with recognizing and rewarding the highest standards of marketing activities undertaken by airports. The 2013 awards will see a number of innovations including taking a blended approach to the nomination process, meaning the final nominees will include a number of airports who will be shortlisted using our online voting form together with a number of airports who have been selected by a panel of industry experts drawn from the airline network planning community. This year the awards were split into two categories based on the size of the airport and also a new tourism award for best destination marketing campaign by a tourism authority. Kilimanjaro were also named as the winner from the Under 4 Million Passengers category with Nairobi - Jomo Kenyatta International Airport ranked top from the Over 4 Million Passengers category and the Destination Marketing Award went to Seychelles Tourism Board. As overall winner of this regional heat, Kilimanjaro International Airport will be automatically shortlisted for the World Routes Airport Marketing Awards which will take place at the event in Las Vegas, 5-8 October 2013. Kilimanjaro join San Diego International Airport, Changi Airport Group and Munich Airport who were announced as overall winners of the Americas, Asia and Europe heats respectively, earlier in the year. The Comox Valley Airport has been named one of the world’s most effective rebrands in the eighth annual REBRAND 100® Global Awards. This award is the highest recognition for excellence in brand repositioning, and is the first and most-respected global program of its kind. “Many projects had big ideas expressed elegantly through all methods of engagement—language, visuals, sound, etc.” said Shashi Caan, Founding Principal, The Collective US and UK and 2012 juror. Each year, an international and multidisciplinary mix of industry experts convenes to jury this annual competition. They consider “before” and “after” representations of brand transformations with written summaries and supporting elements that showcase integration of social media and mobile engagement. The Comox Valley Airport’s corporate rebrand was launched in July 2011 and embodies its world-class service and local charm, bringing to life the unique stories of travelers to the area. The brand which has received Merit level recognition as one of the top 100 global rebrands, now serves as a platform for all marketing and communications activities for the airport. REBRAND™ is the world's leading resource for effective brand transformations. The REBRAND 100 Global Awards is the first and most respected recognition for repositioned brands. Featured in such media as The Wall Street Journal, CNN Money, Bloomberg Businessweek, various magazines and books, the annual competition has entry deadlines in late September. The full 2012 winners showcase is at www.rebrand.com.